Robson has won seven national scholastic titles and finished in the top ten at each of the World Youth Chess Championships from 2004 to 2007. He also tied for first place in the 2005 and 2006 (U12 Boys, Silver on tiebreak) Pan American Youth Chess Championships. On July 16, 2009, he won the U.S. Junior Chess Championship, becoming one of the youngest champions ever. Robson played in his first World Cup in November 2009 in Russia and again in 2011. 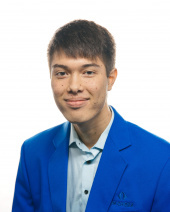 Robson has also won the Webster University - SPICE Cup Open in St. Louis in 2012, and he finished second in Millionaire Chess in Las Vegas in 2014, losing to Wesley So in the final round. Even more, Robson has played in many of the major open tournaments in the United States, including the U.S. Championships since 2007. When he qualified for the 2007 U.S. Championships, it made him the youngest player in the history of the event to participate.